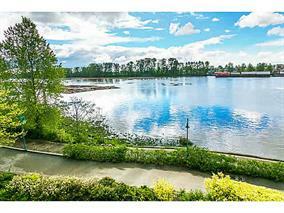 This beautiful bright open-planned waterfront penthouse has sweeping views over the Fraser River. Fully renovated kitchen with s/s appliances, induction stove, and quartz counters. Hardwood floors through out, the large living area has roo m for entertaining with a vaulted ceiling, floor to ceiling windows and new slate gas fireplace. The large private outdoor deck over looks the Fraser River and is perfect for summer BBQing. 2 secured parking and in-suite storage. Pets allowed.